Given the huge success of the TR2, Rotecna expands its range of dry feed hoppers to fattening with the TR3D. This is a new two-sided model with three outlet nozzles, designed to supply large pens of animals. The V-shaped design of the side nozzles means animals can be arranged diagonally, whereby they can eat peacefully without bothering each other, thus avoiding fights and feed wastage. So, the TR3D, with a height of more than 1 meter and a capacity of 330 litres, can feed up to 66 animals. With other similar hoppers, it is difficult for three large pigs to eat at the same time, thus limiting performance. The TR3D maintains the main advantages of the successful TR2, and its simple control system using a sandwich gate means the release of feed can be controlled with one hand, and point by point transition is quick and precise (10 positions). The sandwich system means the hopper is easy to manipulate even when full, as the sliding gate is protected by two plates between which it slides smoothly, without having to be resistant to the feed, since it is not in contact with it. One of the main advantages of this hopper is that the farmer can adjust each side of the TR3D separately. This feature is very useful when working with pens containing pigs of different sizes, different numbers of animals per pen, or when only wanting pigs on one side to eat. 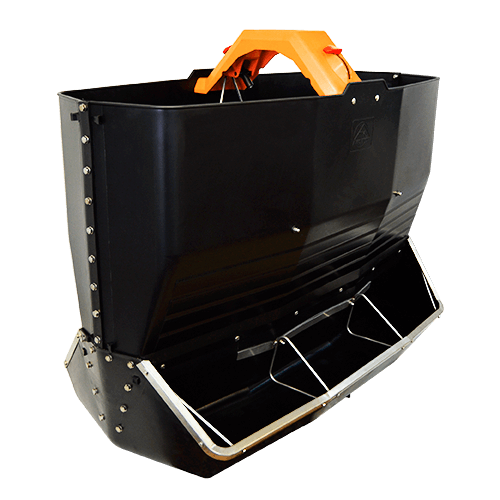 The TR3D is made entirely of plastic and stainless steel, making it a solid hopper that is resistant to animal impact and the corrosive agents found on farms, therefore providing greater durability. Additionally, the use of a non-porous material like plastic improves hygiene and disinfection, in turn reducing water consumption and the time that a farmer needs to spend on these tasks. And this guarantees a better result, with the benefits this brings from the point of view of sanitation and animal health. The TR3D has been designed in a similar fashion to the other TR Rotecna hoppers (TR2, TR4 and TR5). It small slants on the inside that ensure that the feed slides smoothly and doesn't accumulate or solidify. Meanwhile, the rounded design of the outlet nozzles, with no corners, is another of the benefits of the TR3D that make it easier for pigs to get to their feed, to prevent the accumulation of feed in these spaces and subsequent wastage. The TR3D can be anchored to the ground in the middle of a pen or be installed in dividing panels in order to feed two pens of up to 33 animals each.